You have no budget. You need toput your money where your mouth is. Are you willing to commit hard-earned dollars to this effort? Or will you be be like everyone else who says, “Our product is so good we don’t need to market or advertise.” Yeah and Coke doesn’t advertise either. You have no metrics. This is the age of big data. If you have no data on your customers then forget marketing to them. Patrons expect customization and personalization. In fact they demand it. They have become so used to it that if you don’t do it, they notice. Get on your numbers and don’t get left behind. You have no customer testimonials. Everyone today expects to be asked to testify about a product or service they like. Get that going and watch word-of-mouth really take off. Because of social media, everyone has a voice and a lot of regular people have become local experts on yelp especially when it comes to food. 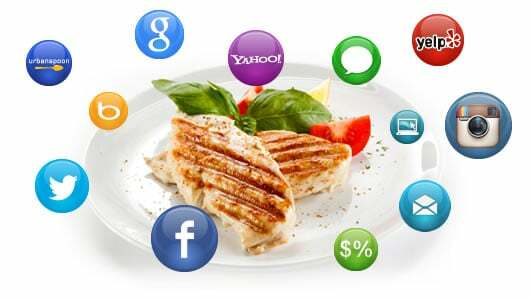 Ride the trend of foodie reviews and influence. You ignore social media. You started a Facebook page and a Twitter account and then you blew it off. Your last post on Instagram was a year ago and you don’t even know what to do about Yelp, much less Pinterest. How can you expect to succeed in this new age of social media marketing when you won’t address the basics? Get it going. Outsource it if you have to. You simply don’t have a choice. >>Download this free ebook and get more ideas to prove the value of your restaurant marketing. You don’t know your purpose. Sounds like a strange one right? This is along the same lines of not having a plan because it requires real thought. What truly is your mission? People buy when they know why. What is your why? The faster you answer that the quicker you will attract a loyal following. You don’t have a newsletter. It’s hard work having a newsletter and you simply don’t have the time to do it. But you need to develop a relationship with the folks who are willing to give you their email address. And you need to then provide them with something of value. Email marketing takes effort and time but in the end it will all be worth it. You don’t believe in blogging. Same as above. You need to position yourself as THE ONLINE AUTHORITY in your local market. With content marketing you can add some real value to the food discussion and cut through all the noise with a unique take on the industry. Google loves nothing more than fresh daily content. You need to feed that beast and watch your search rankings soar. Your nephew does your marketing. Do we even need to go there? How can you complain about sales when you have no trained experts doing the hard work? Stop being cheap and INVEST in a partnership with a marketing and design agency that specializes in restaurants. We can think of one in particular. You don’t ask your customers questions. Probably because you don’t want to hear the answers. Nothing will pay off more in the short run than to get real live feedback. And trust us, they will tell you the truth. Everyone has an opinion and most people love to share it. Let them. You will profit from it.